Unless you have been hiding under a rock for the past year, you have heard net neutrality mentioned in the news over and over again, especially in the last month. Because unless we do something to stop it, Federal Communications Committee Chairman Ajit Pai is determined to push a vote Thursday that will completely dismantle it—and that will be bad for everyone. Net neutrality refers to what we know as the open internet. The way things are set up now, you can get to The Root just as quickly as you can get to Facebook or Amazon.com or the New York Times. Aside from sites blocked by firewalls your employer may have set up, you have open access to any website you want. Net neutrality is what makes this possible. It’s the idea that everyone should have access to everything no matter what, as long as they have internet access. We’ve already witnessed what happens when internet service providers decide they aren’t getting a big-enough piece of the pie when it comes to broadband data. Three years ago, Netflix raised the service cost for subscribers to its streaming service, and this was the direct result of a battle the company had been having with ISPs, including Comcast, AT&T and Verizon. The ISPs were accused of slowing down service (called throttling) when their users streamed Netflix’s content. Even though consumers (that’s you and me) had already paid both Netflix and our ISPs for access to stream video content, the ISPs felt that Netflix should pay a premium on top of that to deliver instant video content via the ISPs’ direct connections. Netflix fought it at first but eventually caved to the pressure and paid the money. Netflix then passed that cost along to its customers in the form of a price increase. What that looks like now. Back when the Netflix settlement happened, it was a big deal because it was a sign of things to come. Being such a big, profitable company, Netflix could afford to break bread with the big internet companies, but what about smaller businesses? How would they be able to compete in such a market? That concern is even greater now. 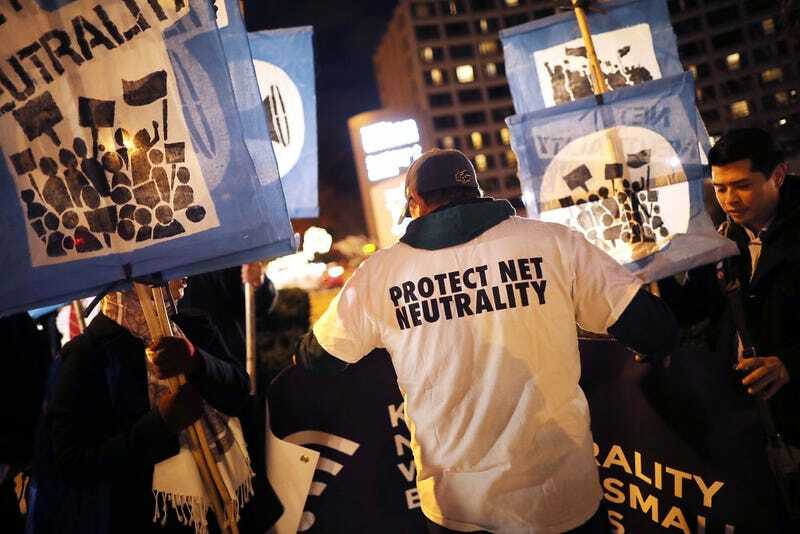 An FCC repeal of the net neutrality protections the Obama administration put in place opens the door for ISPs to decide which content gets priority over others on the internet. Voices can and will be silenced. People will be disenfranchised. Even scarier, it opens the door for your provider to create a package program in which you have to pay different prices to access different types of content on the internet. How many people will be priced out of that? And think about this: Let’s say your ISP decides to create a company that offers a streaming video service similar to what Netflix has now. A repeal of net neutrality means that the ISP can block your access to Netflix and force you to use its product instead. Repealing net neutrality means the death of the open market. That is bad for everyone. Although this will impact social media, it’s about so much more. Social media users will likely take the biggest hit when this happens. If ISPs are able to make you pay for a separate package to access Twitter, Facebook, Instagram and other social sites, there are a great many people who will not be able to afford that. That will affect people who run small businesses. It will impact activists who use social media to organize and get information out. It will affect creators who use social media as a vehicle to push their art. Social media has been a major tool for the dissemination of important information, especially for people of color. Who do you think will be the first voices silenced if this happens? You don’t think that’s part of the plan? This is also about the disenfranchisement of poor people. Poor people will be disproportionately affected by this. They can’t afford to pay for tiered data plans. They can’t afford to pay for fast-lane access to websites. People who depend on the internet to search for jobs will be affected. There are plenty of people who don’t have internet access at home and instead go to their local library to look up information, do research and job searches, etc. If you live in a city like mine, you know that public libraries are usually the first to lose funding when city budgets have to be revised. What happens when your public library cannot afford to pay for fast-lane internet access or excessive premiums to access certain content? Who suffers then? It’s time to do more than retweet. It’s time to take action. The bottom line is if we don’t do something to stop this, it’s the end of the internet as we know it, and that won’t be good for anyone—most especially black people and other people of color. Right now, we can get Congress to help us stop this vote. It costs you nothing but a few minutes of your time to click on this link, send a quick letter to Congress and then call your representatives to urge them to stop the vote. The free internet depends on your action. Please do something to keep things as they are. Tomorrow will be too late.